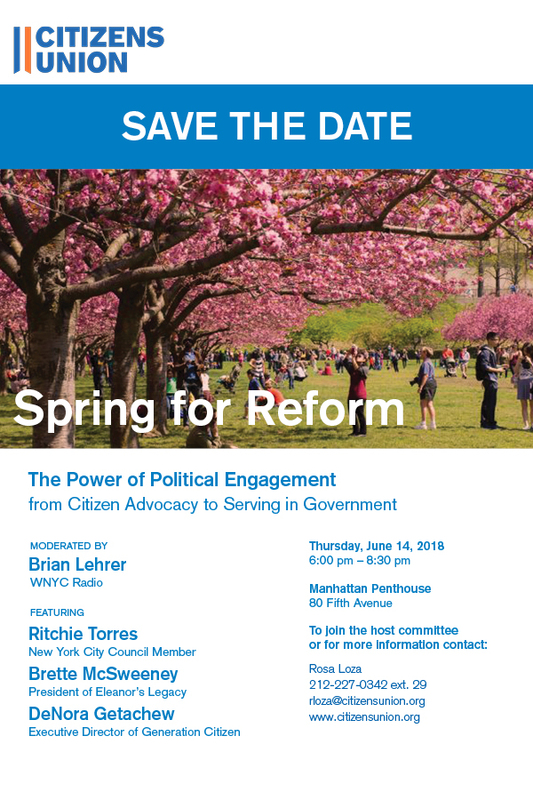 Spring for Reform is Citizens Union’s annual event to engage new audiences in its work. The event will take place on June 14 at The Manhattan Penthouse, 80 Fifth Avenue at 14th Street, in Manhattan. The event starts at 6 p.m. with a cocktail reception. The program runs 7-8 p.m. and will be moderated by political reporter Brian Lehrer. This year the topic is increasing civic engagement, and the panelists currently include DeNora Getachew from Generation Citizen (promoting civics education in K-12 schools), Andrea Catsimatidis (chairwoman of the Manhattan Republican Party), and Brette McSweeney from Eleanor’s Legacy (supporting Democratic women in NY politics).